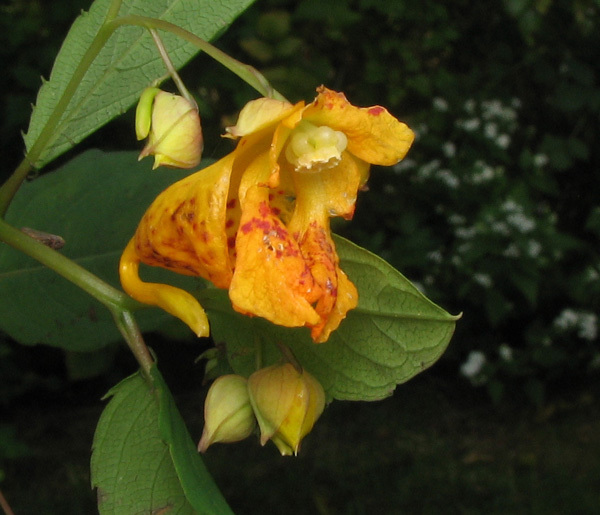 A jewelweed blossom is worth examining carefully; it is a little marvel of engineering, with a shape perfectly adapted to its pollinator, a plump bumblebee with a very long tongue and a thirst for nectar. 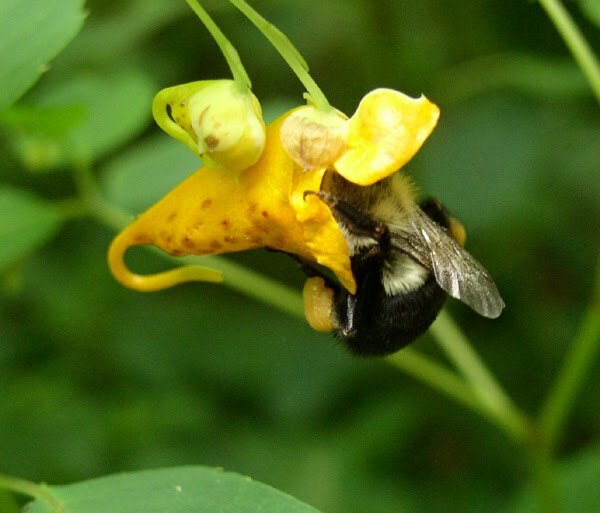 The shape of the little sac fits the body of the bumblebee like a glove; the side petals open like a pair of curtains to allow its entrance; the length of its spur, full of nectar is just right for the tongue of the bumblebee. And, finally and most important to the plant, the anthers (that carry the pollen) and the stigma (which receives the pollen) are placed so that the hairy back of the bumblebee rubs against them when entering the flower. 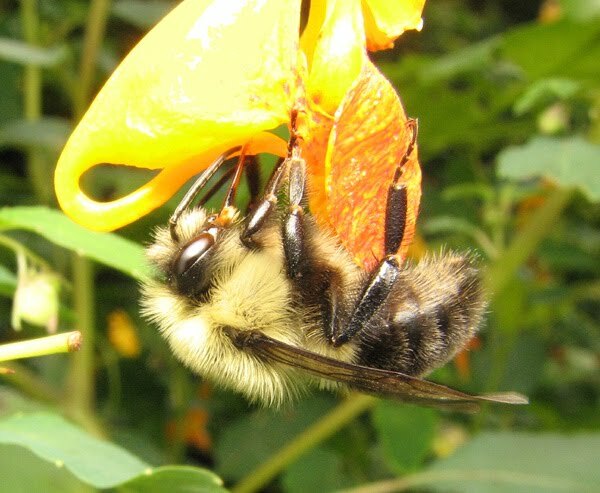 The pollen is deposited on the bee and later on it is transported to other flowers. For pollination to take place the bee has to enter the front of the flower otherwise it would fail to touch the parts of the flower that matter. Despite this marvelous system, some very nice pollinators can turn into robbers and cheat the flowers that they usually serve diligently. This happens when the pollinator chooses to take a shortcut and bypass the well planned scheme of the flower. Such is the case of this bumblebee. When it takes nectar by slashing the spur from the outside it doesn’t come near the pollen carrying organs and doesn’t perform pollination. 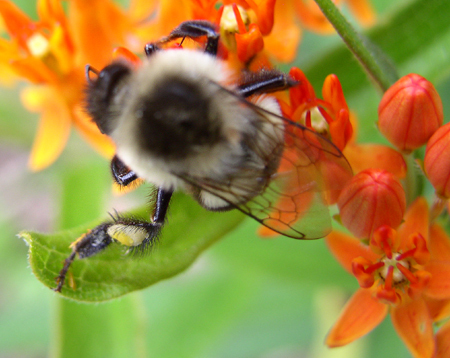 Bumble bees are excellent pollinators and they are used in agriculture. In some cases they are more efficient than honey bees, the jack of all trades of the pollinators’ world. They are particularly important when the flowers require buzz pollination, a task that honey bees never mastered. 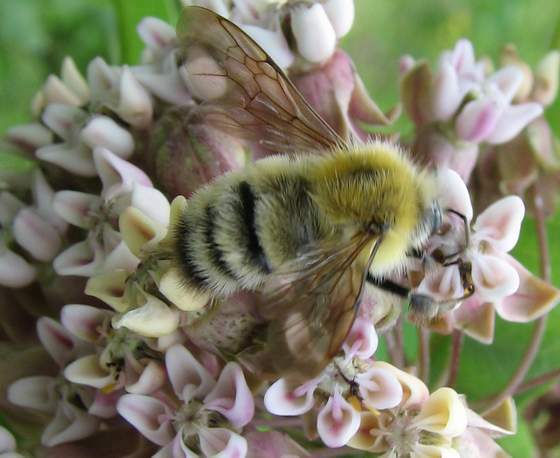 Such behavior is described and illustrated here: Bumble bees as pollinators. Tomato growers, especially those who grow tomatoes in large greenhouses, use the services of bumble bees. Bumble bee colonies are relatively easy to raise and to maintain; thus a whole minor industry has developed. Several bumble bee breeders provide queens and special boxes where the queen can raise a whole colony, along with instructions on how many boxes are needed per acre of plants and how much sugary water should be added to their diet. Tomatoes are good at supplying pollen but not nectar and bumble bees, like all other bees, require both. There is great concern about the possibility of carrying pathogens when these boxes are shipped to other places. 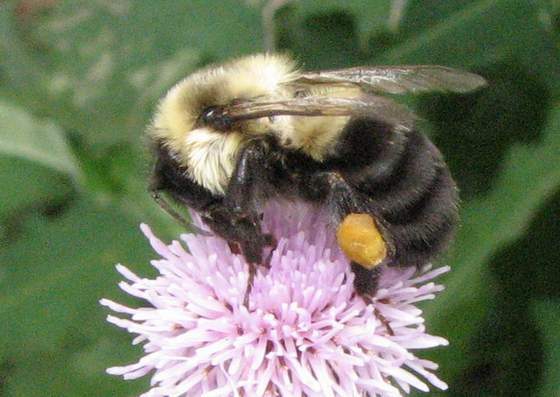 Also there is the possibility of honey bees passing their pathogens to bumble bees. It is important to take precautions to avoid such consequences. In addition to being important in agriculture bumble bees, along with many other species of bees, pollinate a large number of native flowers and thus contribute to the normal functioning of ecosystems. You are currently browsing the archives for the bumble bee category.